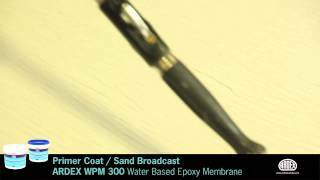 ARDEX WPM 300 is a two component water based epoxy polyamide membrane/barrier coating. Low water vapour transmission coating and as a barrier/seal coating over freshly laid or damp concrete. Waterproofing barrier on the negative side in below grade surfaces such as basements, tunnels, liftwells, retaining walls and carparks. Waterproofing membrane or barrier coating over freshly laid hardened concrete, prior to the application of conventional levelling compounds carpet and tile adhesives. As a barrier seal coating over damp, green or efllorescence producing concrete prior to overcoating with conventional building paints.